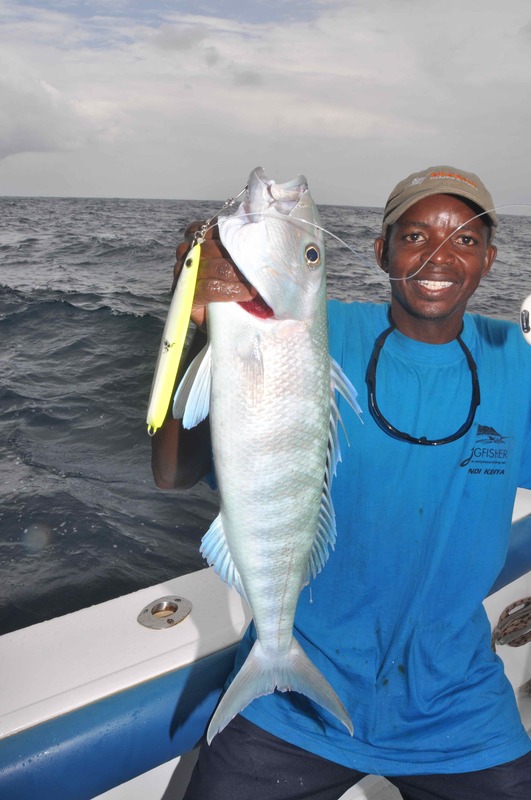 An article on a great trip to Kenya , includes some informative information on jigging/popping throughout the tropics in general. 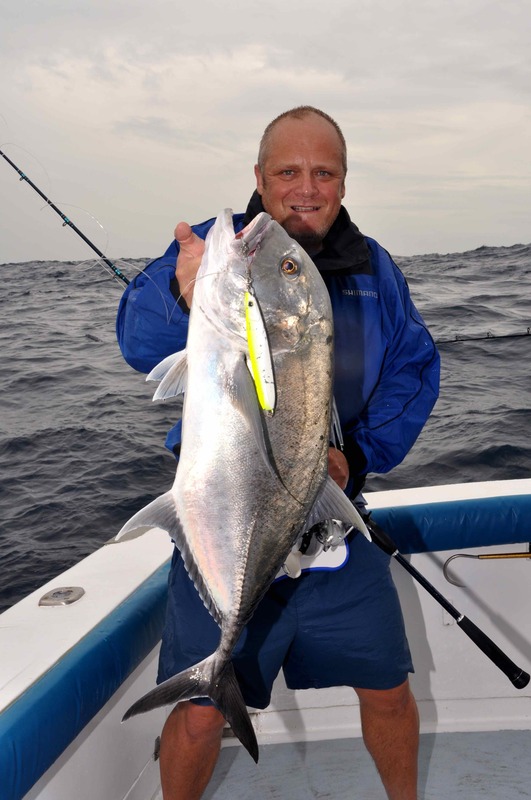 During the past decade my interest in fishing tropical seas has become focused more upon speed jigging and surface popping rather than trolling. 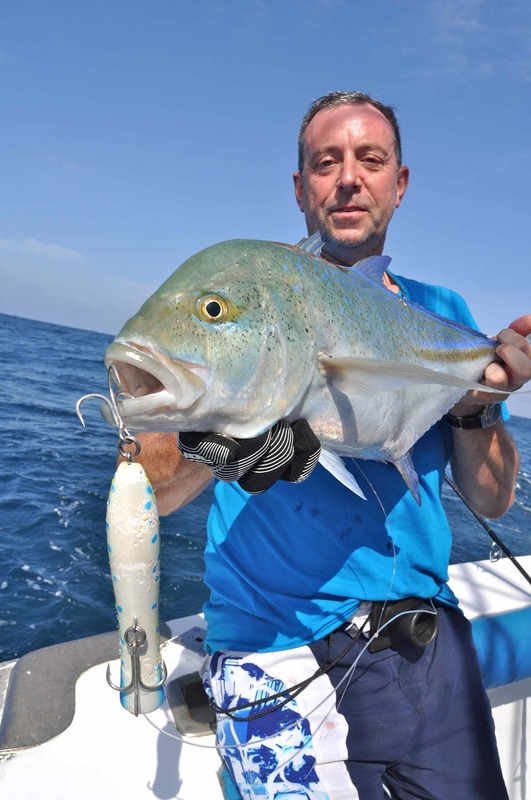 These techniques are very much hands on, they allow the anglers to fully experience the crashing ‘take’ and that initial surge of power once the hook is set, which is typical from some of the oceans toughest fighting fish, notably the various species of trevally, snapper and grouper found in these waters. 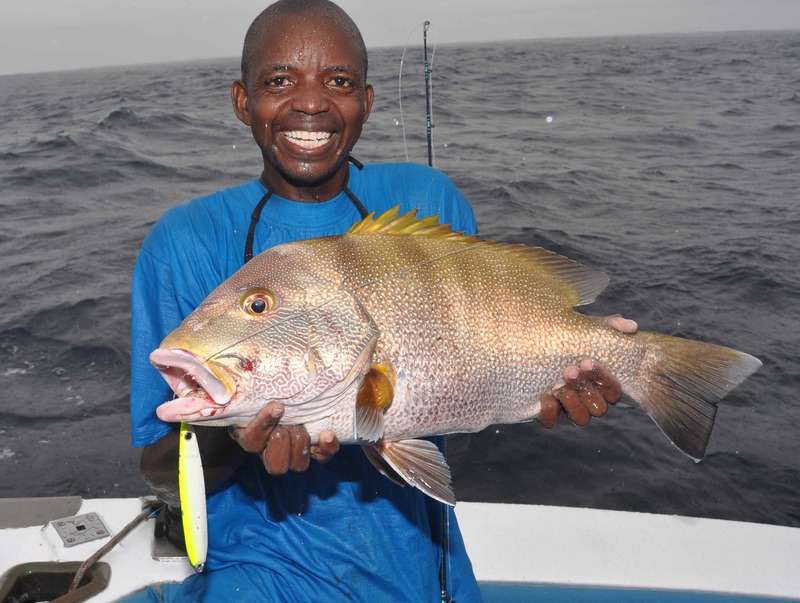 Despite on many occasions jigging and popping at many other destinations throughout the Indian Ocean, I’d never had the opportunity to try either of these techniques in Kenya. 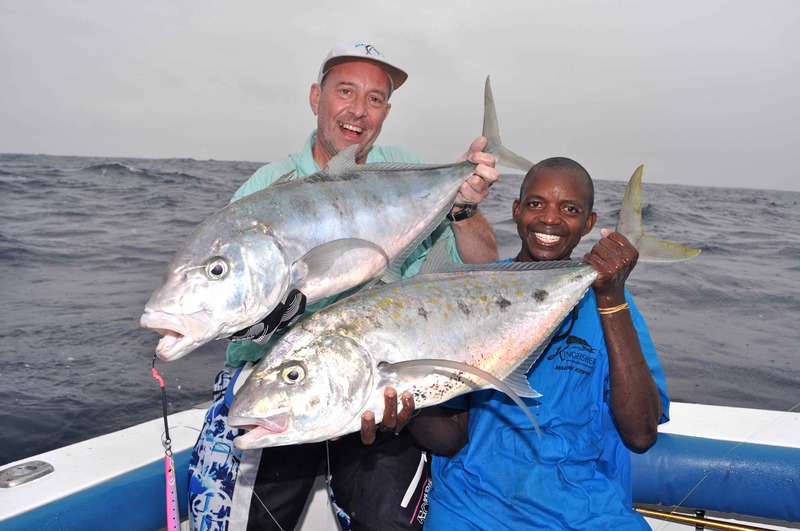 Then, last October, I received an invitation from Angus and Adrian Paul who run Malindi based Kingfisher boats, both are good friends and suggested a weeks fishing to see just how effective jigs and poppers were. The plan was to spend our time fishing marks Angus had frequently trolled over and had noted held decent concentrations of fish. Most likely these were small isolated reefs, rock ridges, drop offs and banks often with distinctive tide rips; classic fish holding structure the world over. We had also intended to try some marks further offshore in deeper water, but the weather during our trip was unseasonably rough limiting us to fishing marks within sight of land along the stretch of coastline between Malindi and Watamu. Despite this handicap, every day we experienced some truly amazing rod bending action. 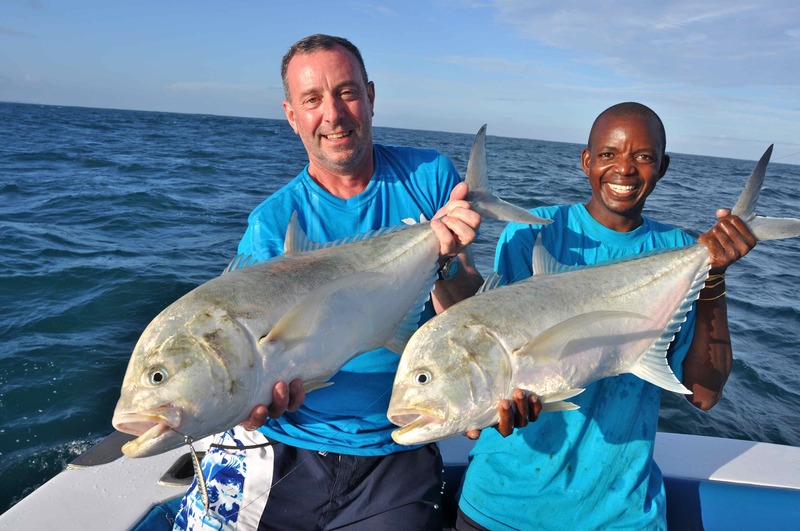 On our first afternoon we ran barely half an hour south from Malindi and stopped over a small reef lying in 160ft of water, where despite a fair run of current we managed to fish effectively with jigs between 200-270g. 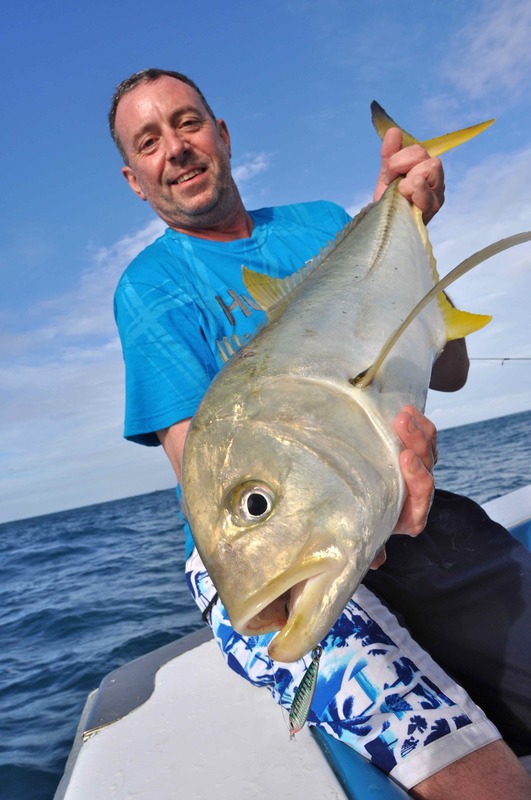 From the very first drop we were into fish, mostly powerful yellow spot trevally averaging 10-20lb, which despite a heavy clutch setting effortlessly ripped many yards of line off our reels. 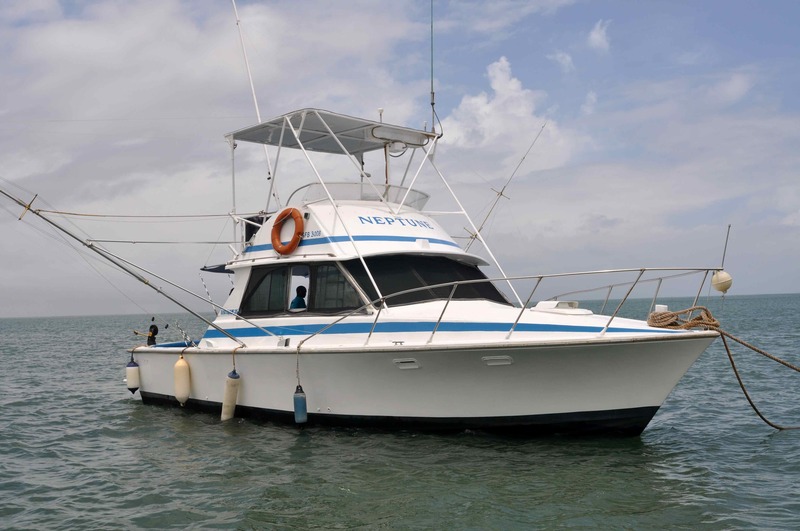 That first mark also produced several large and equally powerful bludger and bluefin trevally, plus smaller blacktip and bigeye trevally along with numerous amazingly colourful species of snapper and grouper, such as the sweet tasting swallow tailed rock cod and blubber lips snapper. So what is speed jigging, is it just the same as pirking here in the UK? Well the answer is both yes and no; let me try and explain! Speed jigging involves fishing a metal lure in a vertical plane, as the name implies at high speed. At first glance a speed jig might look similar to some traditional cod pirks, but the better quality jigs are engineered with precision formed angles to ensure that when worked correctly they give the very best action. 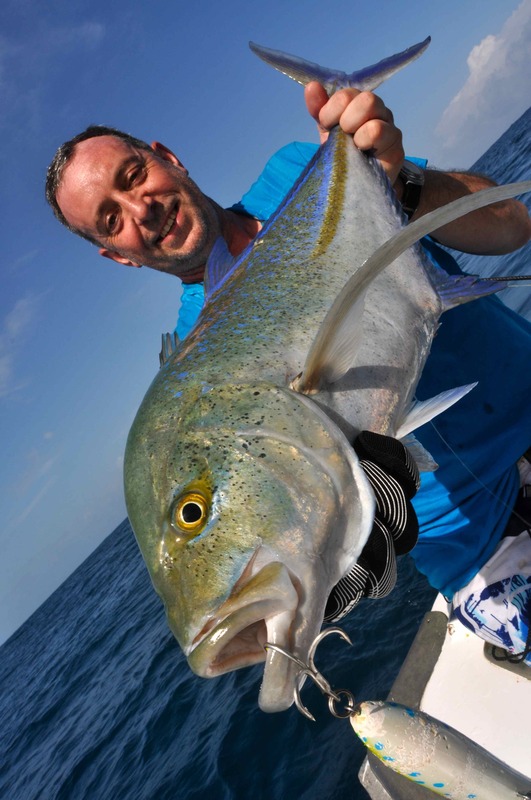 Tropical speed jigs work very well in colder northern seas when fished at a more sedate speed, but while on some day’s ordinary cold water pirks will catch a few fish in the tropics, overall they are not nearly as effective as purpose designed speed jigs. Unlike pirks that are invariably fished with a single treble hook at the bottom, speed jigs are rigged with a single ‘assist hook’, which is attached at the top of the lure. The assist hook, usually a very strong, very sharp short shank hook, is attached via either a length of Kevlar braid, or occasionally steel wire if barracuda, wahoo and the like are present. The assist hook should hang down so that the point is lying between one third and a half the length of the jig. There are several ways the assist hook can be attached, the most straightforward being to loop it directly to the top wire attachment of the jig, which is invariably what I do. Technically the correct way is to attach the assist hook is to loop it onto a solid fixed ring tied to the end of your leader, which is then attached to the jig using a very strong split ring. One advantage in attaching the jig this way is that it allows you to quickly change the size/weight/colour of the jig simply by removing it from the split ring and reattaching the new one. As a rule of thumb I like to use the lightest jig that will allow me to fish effectively, i.e. vertically, which usually means changing lures several times a day. Regarding colour, I don’t mind which colour I use in the tropics, provided it is either chartreuse or hot pink! Seriously, on many days these really are the most effective colours, but occasionally I do try others. 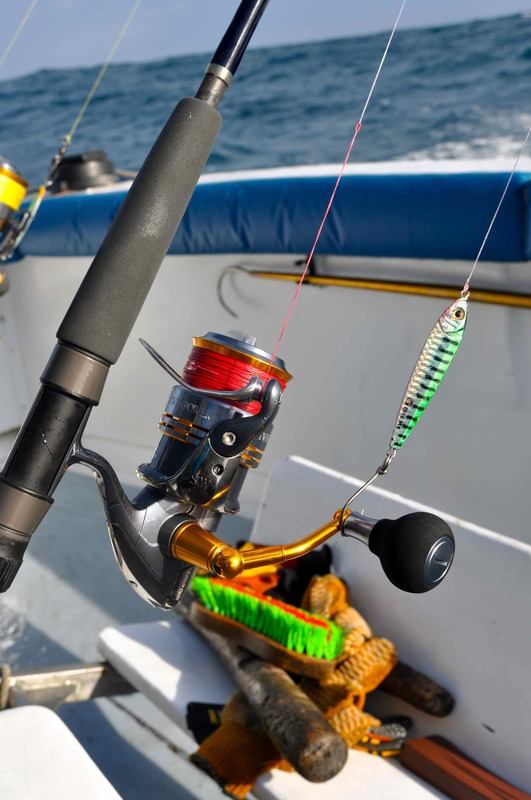 There are three reasons why assist hooks are attached the way they are. Firstly, when jigging over a coral reef you have much more chance of the hook getting snagged if it is fixed at the bottom of the jig. Secondly, most predatory species strike at baitfish midway down the body, so the assist hook is actually fishing in the area of the jig most likely to result in a hook up. 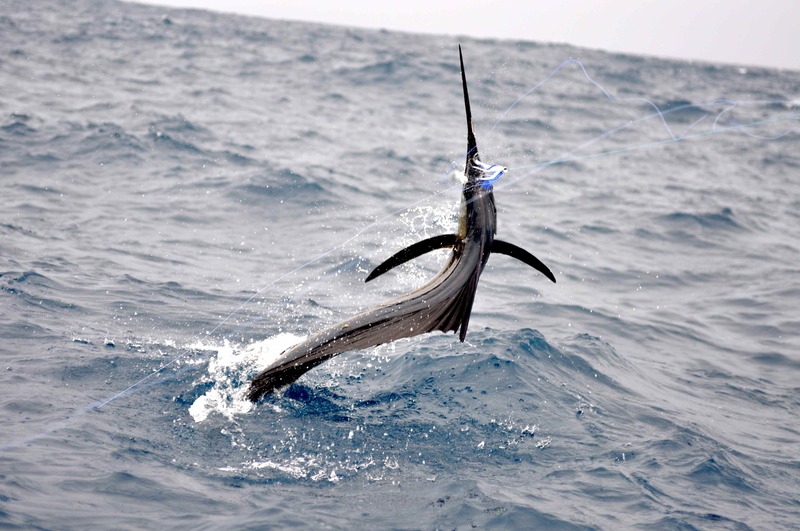 Thirdly, by attaching the assist at the top of the jig, when a fish is hooked you will have a direct line of contact between the leader and the hook, especially if you adopt the solid ring technique of attachment. This greatly reduces the risk of the fish shaking the lure free during the fight. Remember tropical species fight significantly more aggressively than our coldwater species such as cod. The real art in speed jigging is in the way you fishing the lure. To get the best action you’ll need a relatively short rod rigged with a high-speed reel; a reel with a retrieve in the region of 6:1 is ideal. I prefer a multiplier when jigging; many other experienced anglers favour a fixed spool. The reel should be loaded with a high quality braid, I use 80lbBS PowerPro, to which is attached either a monofilament or fluorocarbon leader of around 100lbBS. As the jig is falling down through the water column, remain alert for hits on the drop. If you feel anything at all immediately reengage the reel and start to work the jig with a combined jigging and fast reeling action, which will often result in a hook up. If the jig gets to the bottom unmolested use the same fast combined jigging/reeling action to work the jig swiftly back up through the water column; often you’ll get hits surprisingly high up from the bottom, so be prepared to work as much water a possible in order to locate fish. Speed jigging is also known as vertical jigging because the lure works best when fished vertically beneath the boat. Often I have anglers join me on my group trips who have never jigged in the tropics before, and I always advise them to imagine a torch shining straight directly down the bottom from the boat. I tell them to keep their jig working within the imaginary beam of torchlight, and that as soon as the angle of their line increases so that the jig would be outside of the light, to reel in and start again. In order to achieve this, especially on fast drifts over isolated marks, casting the lure 30-40 yards in the direction in which the boat is drifting will maximise the time the jig is fishing effectively. During the next few days we jigged at numerous different marks, and they all produced lots of fish. One or two in particular were productive for GT’s; we tagged over 20 in two short sessions. As GT’s go these were not especially big fish but at 10-25lb they were plenty big enough to bend a rod and rip line off a reel. We added king mackerel, green jobfish, little tunny, barracuda and several other species to our list of jig caught fish, and all the time Angus kept saying how he really wished the weather was suitable to go offshore and fish the ‘best spots’! 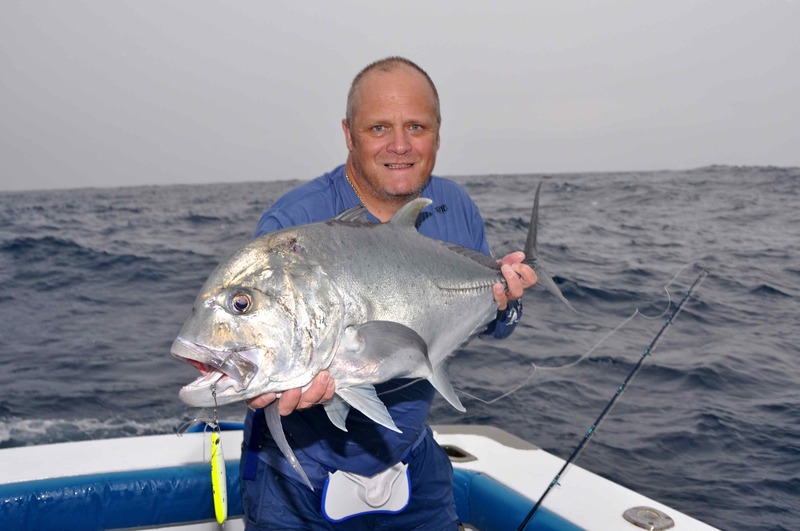 Most afternoons we encountered vast shoals of surface feeding brassy trevally and blacktip trevally feeding just outside of the reefs off Malindi, and these provided truly amazing sport casting 40-60g on light spinning rods. Again most of the trevally we caught were modest 10-20lb fish, but on the tackle we were using we experienced a level of sport unmatched by anything on offer around the coast of northern Europe. 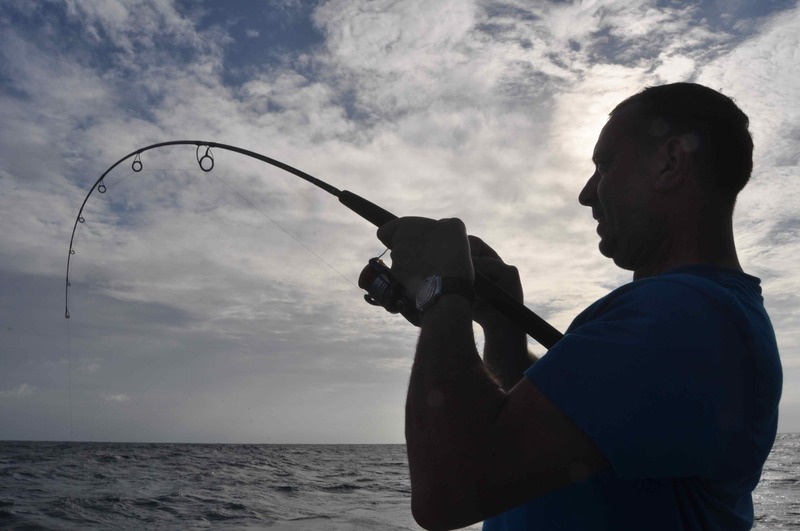 It wasn’t until the last day before conditions improved sufficiently for a serious shot at surface popping, a technique that goes hand in glove with speed jigging in the tropics. For this you need a substantial spinning rod, a strong uptider will do at a push, plus a high quality fixed spool reel loaded with a minimum 80lbBS braid and capable of producing around 30lb of drag, which is a lot of drag! Angus took us to the famed Watamu Banks, where we could see vast flocks of birds feeding over acres of baitfish. It’s a sight guaranteed to set your heart hammering, but our enthusiasm was tempered by reports from the few boats fishing the banks who reported little action all day. We needn’t have worried though as no soon had we started hurling huge surface poppers into the middle of this feeding frenzy, when we got our first strikes from big bluefin trevally. Our poppers also raised several wahoo, king mackerel and dorado along with some seriously big GT’s. 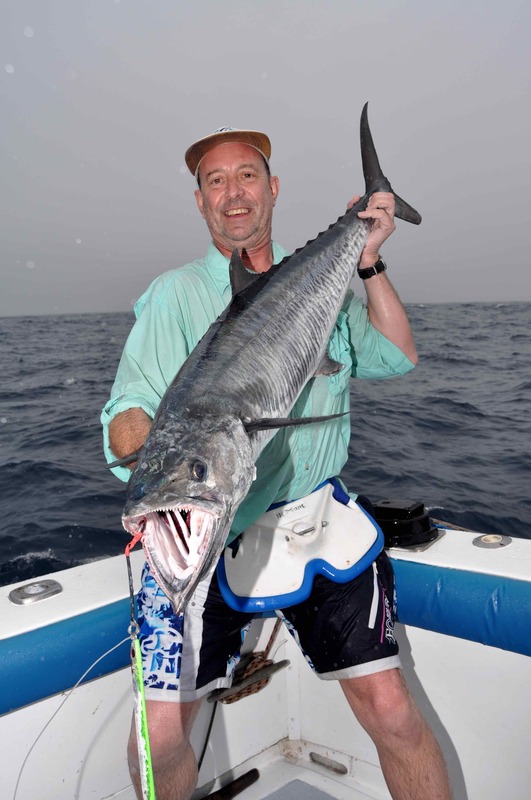 When finally I came tight on one of these monsters all I could do was hang on to my rod as the fish ripped many yards off the reel on its first run, only to be taken by a shark-yes they are abundant off this coast, too!